DC Comics has been selling their titles in the Kindle Store since November and the Nook Store for some weeks now, but it was only today that DC added their first titles to iBooks. Batman: Earth One is a recently published 144 page graphic novel that retells the classic superhero creation story with a few twists. 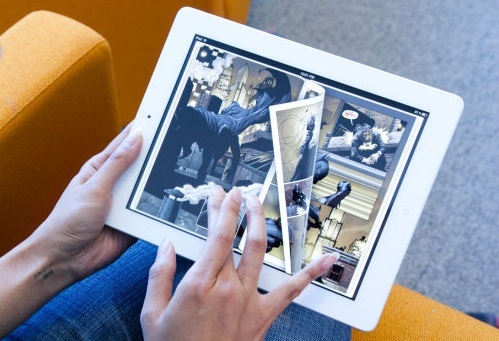 It follows DC's current editorial strategy of mucking with the tried and true formula of established comics titles, and it also represents an expansion of DC's marketing plans where full length graphic novels are sold via Nook, Kindle and iBooks and the monthly serials are sold via DC's branded app, which was developed in partnership with comiXology. This title is priced the same in all 3 ebookstores ($13), so you might want to consider for a moment which platform you want to be tied to. As for me, I'm going to wait out the digital comics market until at least 2 of the current 6 format (Epub3, Kindle, Kobo, Nook, iBooks, comiXology) are thinned from the ranks. In the long run I'm betting both the Kobo and Nook fixed layout formats will be replaced up byEpub3, but I don't expect it to happen anytime soon.